Happy birthday Gloria Kamen (Edward Lear: King of Nonsense) and Margaret Peterson Haddix (Missing series). It’s the birth date of Joseph Krumgold (1908-1980), ...And Now Miguel, Onion John; and Leonard Wibberley (1915-1983), The Mouse That Roared, Flint’s Island. In 1865, Robert E. Lee surrenders at the Appomattox Court House to Ulysses S. Grant, ending The U.S. Civil War. Read Marching to Appomattox: The Footrace that Ended the Civil War by Ken Stark and A Ballad of the Civil War by Mary Stolz, illustrated by Sergio Martinez. In 1939 Marian Anderson sings at the Lincoln Memorial after being denied the chance to perform at the Daughters of the American Revolution’s Constitution Hall. Read The Voice That Challenged a Nation: Marian Anderson and the Struggle for Equal Rights by Russell Freedman. On April 9, 1942, fifty-one elephants performed in a ballet in Madison Square Garden. Although at first this idea seems absurd, the strange but true story is explored by writer Leda Schubert and illustrator Robert Andrew Parker in Ballet of the Elephants, published in 2006. Over the last ten years, picture-book texts have grown shorter, and editors today often say they prefer five hundred to six hundred words—allowing ample room for the illustrator to convey the story. 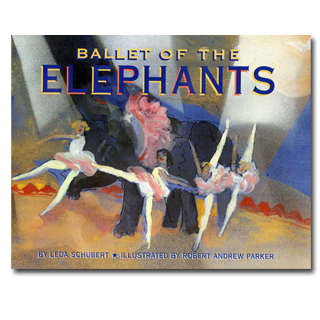 If you want to see what a seasoned picture book author can do with only a few words, Ballet of the Elephants showcases a writer who uses brevity and eloquence to convey a fascinating story. Leda introduces three protagonists—John Ringling North, circus manager who thought of the idea; George Balanchine, ballet master; and Igor Stravinsky, music genius who wrote The Rite of Spring. Although appreciated today, when The Rite of Spring was first performed “people hissed after the first chord. Fistfights broke out in the audience. Stravinsky said his music was best understood by children and animals.” So the three men came up with an amazing plan: produce a ballet for elephants. Balanchine studied how elephants move. Stravinsky crafted Circus Polka, which ended with a march. And the John Ringling North taught the elephants their paces. On opening night, the ballet began with Modoc, the largest Indian elephant in America, dressed in a tutu—a very large tutu—and dancing alone, turning and turning. Then Vera Zorina, world-famous ballerina, danced with him. 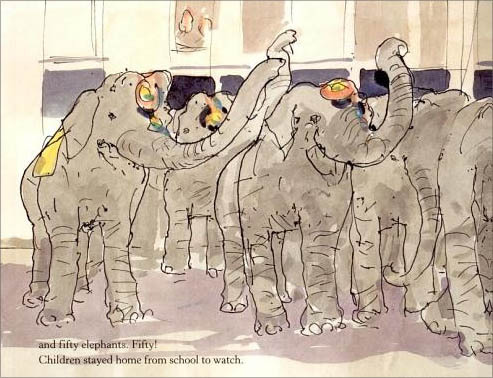 Fifty elephants, the corps de ballet, held one another’s tails and danced in an endless chain. “They raised enormous legs to rest one another’s backs, and trumpeted to Stravinsky’s odd harmonies.” Finally, ballerinas joined in the performance of Circus Polka. They did not hiss or fight. It seemed Stravinsky was right: animals understood his music better than adults. In the author’s note at the end, we learn that the performance toured 104 cities and more than four million people witnessed this production. A fabulous photo of the elephants in full costume adds just the right touch at the end of the book—readers get a glimpse of the actual event. After reading Ballet of the Elephants, adults and children alike wish they lived in 1942 and could have been one of those four million in the big top. Until time travel becomes possible, the best way to experience Circus Polka is simply to reread Leda Schubert’s magnificent text—and watch Robert Andrew Parker use watercolors to bring this performance to life. Few picture information books contain such a naturally interesting subject for children. Drama, dancing elephants, action—it has everything. As P. T. Barnum, circus guru himself said, “When entertaining the public, it is best to have an elephant.” Ballet of the Elephants has fifty-one! Thank you Leda Schubert and Robert Andrew Parker for giving us such a satisfying look at what happened on April 9, 1942. Originally posted April 9, 2011. Updated for . This is a special book. I bet even Truth-Is-Stranger-Than-Fiction Byron couldn’t have imagined an elephant ballet. Hurray for Ballet of the Elephants! One of my all-time favorites. Brilliant writing and gorgeous illustrations honor this extraordinary event. Elephants in tutus just can’t be beat. I’ve shared Leda’s wonderful book with teachers and students alike — everyone is mesmerized and amazed by the actual story, the writing and the illustrations too. The illustration in Ballet for Elephants is so compelling and beautiful! I think it works perfectly to match the beautiful art work with a limited amount of text. Both seem to work together to tell the story beautifully! This sounds hilarious and wonderful- can’t wait to check it out. It also reminds me of another elephant book based on an unbelievable true story: 21 Elephants and Still Standing about another brilliant P.T. Barnum stunt: bringing 21 elephants across the newly completed “eighth wonder of the world,” the Brooklyn Bridge. It’s a great book for a classroom as well. Thanks for introducing me to this one, Anita! If I hadn’t already had a grandson to send this wonderful book to, I would have made my daughter hurry up and get pregnant. Ballet of the Elephants has lines like: “Stravinsky sent the music. It sounded like elephants: sometimes heavy and slow, with drums and trumpeting; sometimes bright, with piccolos and cymbals.” Leda Schubert took this little-known story and rendered it into a beautifully crafted and, yes, graceful piece. Yay for BALLET OF THE ELEPHANTS. Brilliant text. A wonder. And such a pleasure to read! This is a magnificent book!! Love the story behind the scenes. Bravo, Leda! Speaking of another Elephant nonfiction picture book I just finished reading FAITHFUL ELEPHANTS: A true story of Animals, People and War written by Yukio Tsuchiya. I have never been so touched. Highly recommend. Warning:Tissues will be needed. This is the kind of review writers can usually only dream of. Thank you so much, Anita!! Leda: I’m just grateful for this book, one that I recommend all the time.